After a day of skiing at Seven Springs Resort on Saturday with Stevens sister Liz and her boyfriend Jorge, we decided that Sunday would consist of lounging and brunching. 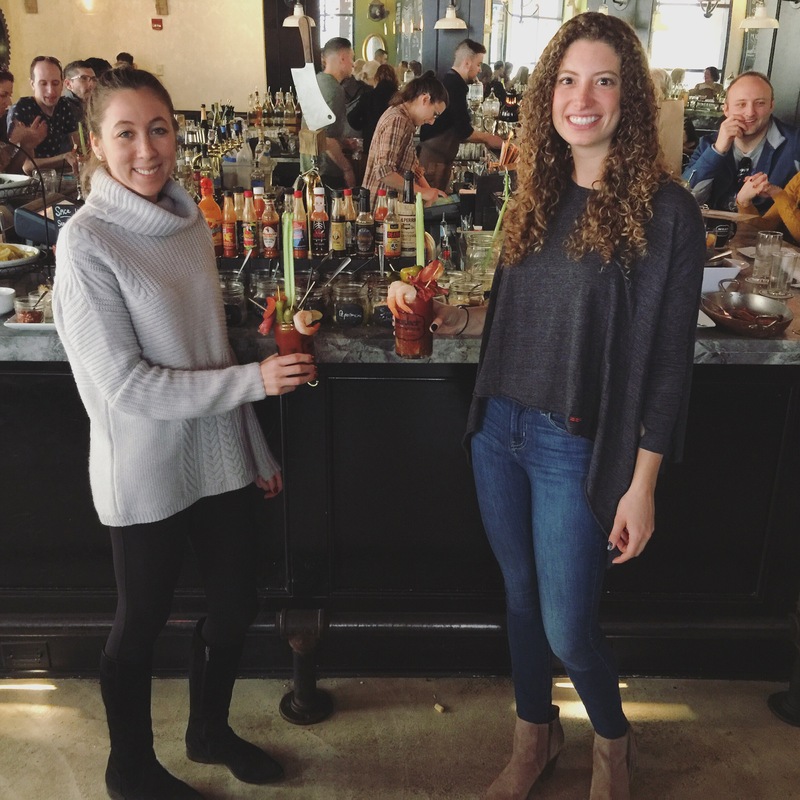 What is better than the best place in Pittsburgh to build your own Bloody Mary for brunch?! So, we headed to Meat and Potatoes downtown. Luckily they were able to accommodate us today, but reservations are strongly encouraged, since this is one of the most sought after brunch spots in the city. Jorge had the Meat and Potatoes take on an old fashion made with bacon bourbon, orange vanilla infused maple syrup, and barrel aged bitters. The drink that took the stage was Steven’s morning manifesto, which we will all be dreaming about until next time. This “libation” includes cold brew coffee, myer’s rum, cereal cream, and orange zest. This was the best coffee cocktail that we have ever had. The girls went with the DIY Bloody Mary, one with honey siracha infused tequila and the other with Tito’s vodka. The waitress brought us our glasses with the alcohol and off we went to the bar to add all the fixings. The bar starts with the house made bloody mix. Then you have a choice of more fixings than you could imagine and I tried to fit almost every one in my glass, including the foot long celery sticks!!! The variety of olives ranged from sun dried tomato to garlic to spicy stuffed green olives and kalamata olives. There were various cubed cheeses as well as salami, pepperoni and prosciutto and, of course, shrimp cocktail. Some innovative add-ons included pickled asparagus, red hot cherry peppers, pepperocini, ham and cheese stuffed pickled peppers and anchovies. They also provided seasoning options such as old bay, rock salt, black pepper, celery salt, garlic, siracha and red pepper flakes. I definitely would have been satisfied with just this amazing Bloody Mary, but what’s brunch without some great food to go along with it?! We started off with the grilled bread served with goat butter and apple butter. The goat butter was creamy and smooth like usual butter, but had a finish of goat cheese. I found that using both spreads together really complimented one another. One of the specials was a cinnamon bun, which we just couldn’t resist. It was very soft and fluffy and topped with the perfect amount of gooey goodness! 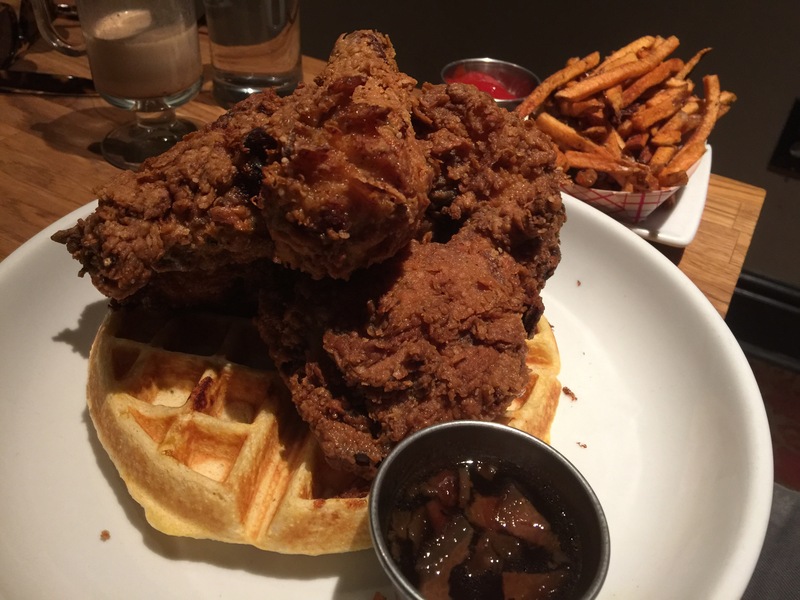 Steven had the chicken and waffles. The chicken was so moist and tender, yet super crispy on the outside. It was served over cheddar jalepeno waffles with bourbon bacon syrup, very very good. 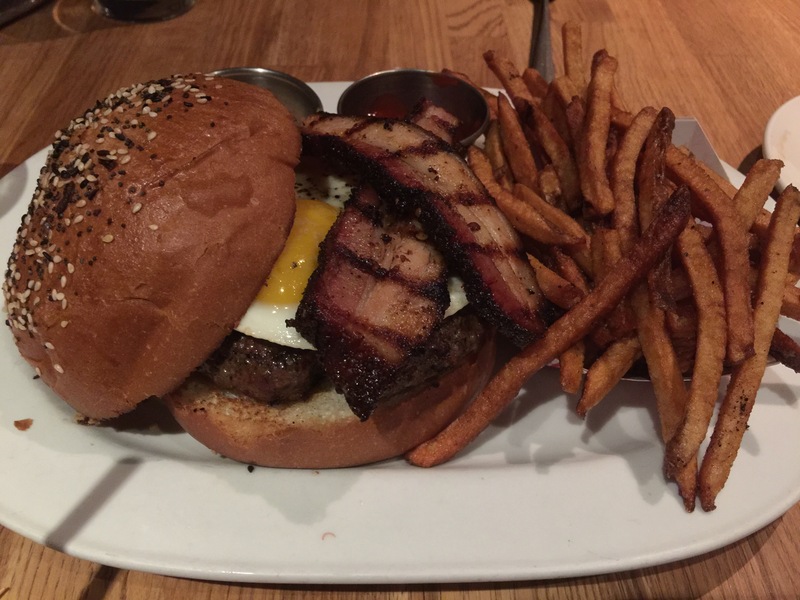 Jorge had the pub burger with a fried egg and pastrami belly, which were two thick slices that was grilled and added a great flavor as opposed to traditional bacon. 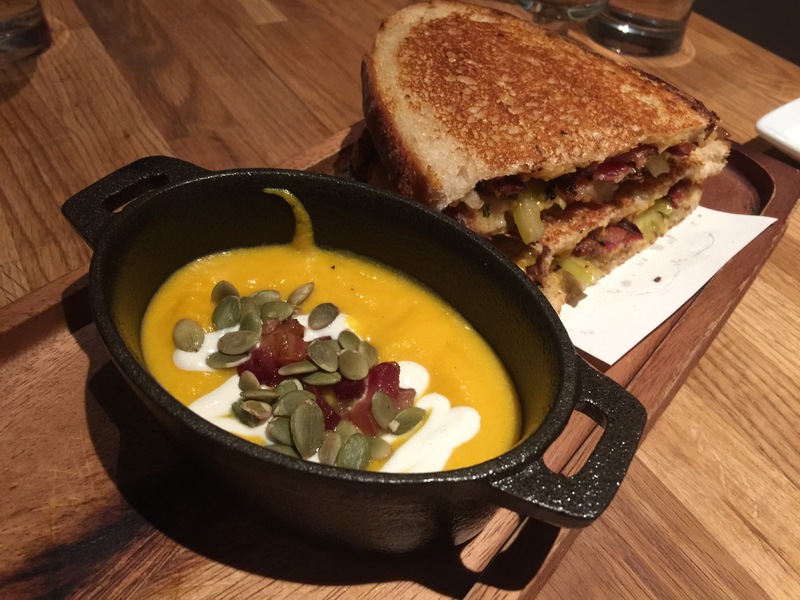 Liz had the grilled cheese with pimento, pickled green tomatoes and black pepper bacon. It was very rich in flavor and served with a butternut squash soup. Jess had the special pancakes, lemon ricotta with a lemon creme and they were divine. 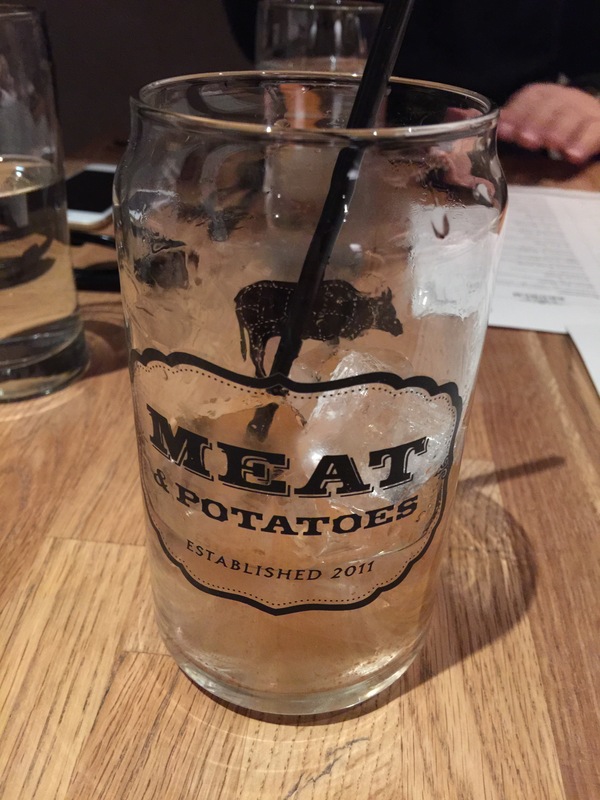 Overall, we would definitely recommend Meat and Potatoes! If you are looking to go, make sure you make a reservation and ask to sit in the main dining area. They had a DJ set up playing great music and the bar in the center gives a great vibe. Also, the decor is very rustic and we loved the wood butcher slab tables. Definitely a great way to end our weekend! Brunch put us all in a food coma so we all lounged and watched a movie before heading home. Previous PostFor my Lehigh family!